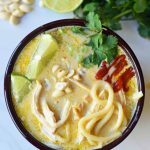 Coconut Curry Noodle Bowls with Chicken in a spiced green curry sauce. An easy flavorful gluten-free dinner. My family begs for Thai food all of the time. 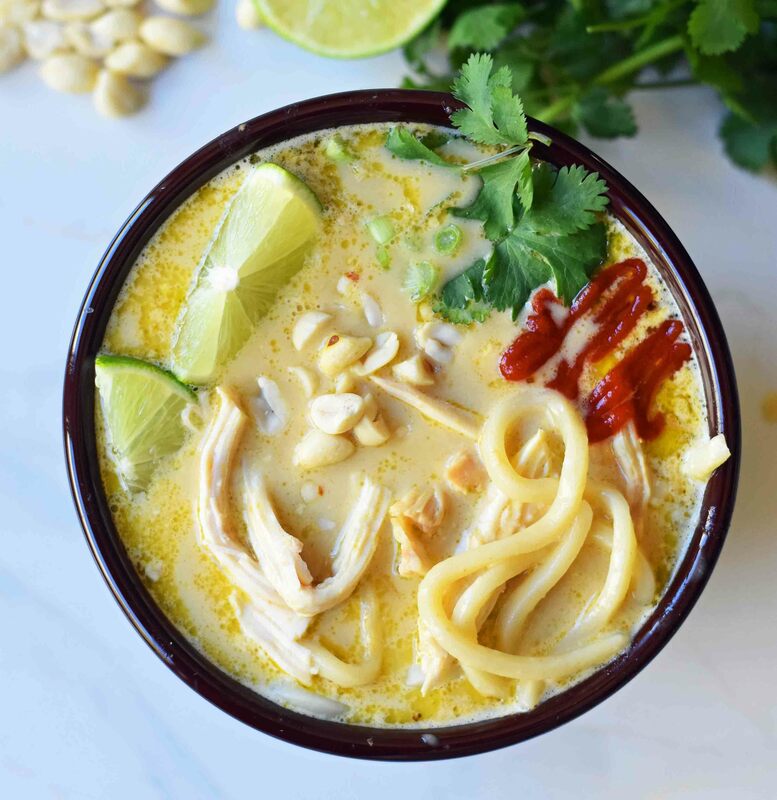 These Thai Curry Noodles are not only easy (we are talking less than 30 minutes, people) but a dinner we crave all of the time. Basically, we drink this stuff like it is going out of style. Is that how the saying goes? Who knows. You get my point, right? The beauty of Asian food is the abundance of spices, which are so good for the body. These noodle bowls are no exception! They make stellar leftovers. The key is getting enough leftover to even make leftovers. These are usually all devoured in our home! I could eat these noodle bowls for lunch every single day. Curry Noodles are a dairy-free and gluten-free dinner made in less than 30 minutes. I have said it before and I will say it again…I don’t like bland food. If I am going to eat healthily, it better taste good! Vegetables can taste amazing. It is all about the right seasoning and cooking techniques to bring out their natural flavors. These Curry Noodles came about out of necessity. It was back in the day when I was eating gluten-free and dairy-free full time. I had to find ways to not miss all of the dairy, cheese, and pasta! This is how these Chicken Curry Noodles came to be. 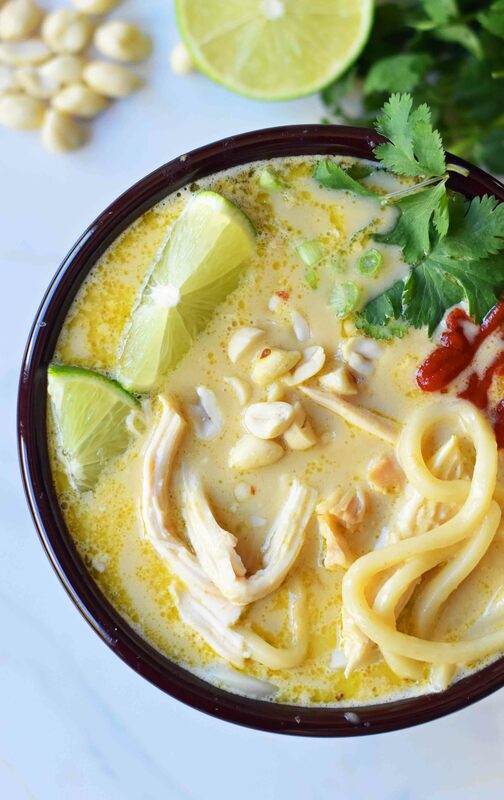 The spices used in these Thai curry noodles are turmeric, ginger, and garlic. All of those spices are known for being wonderful for your immune system. We can say this is an immune system boosting meal. Start off by sauteing onion, garlic, and ginger. This is the base of flavor and important for developing the Asian flavors. Add Green Curry Paste, Brown Sugar (or Agave Nectar), Chicken Broth, Turmeric, Soy Sauce, and Canned Coconut Milk. These ingredients create a creamy coconut curry sauce. Using full-fat canned coconut milk is a real difference maker. If you want it to be sugar-free, you can substitute agave nectar for the brown sugar. Toss with Udon Noodles or Rice Noodles. If you desire it to be gluten-free, use rice noodles. Cook udon or rice noodles according to package instructions and toss into sauce. If you want more noodles, double the number of noodles. Add shredded chicken. You can use shredded poached chicken or rotisserie chicken. 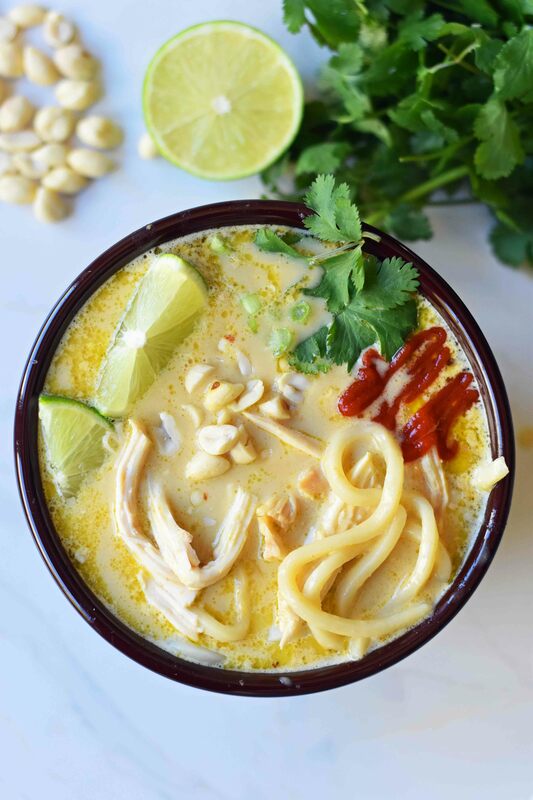 Ladle into bowls and top with fresh lime juice, cilantro, sriracha sauce, and peanuts. If you want a creamy peanut butter flavor, add 1-2 Tablespoons of peanut butter to the creamy coconut sauce before serving. 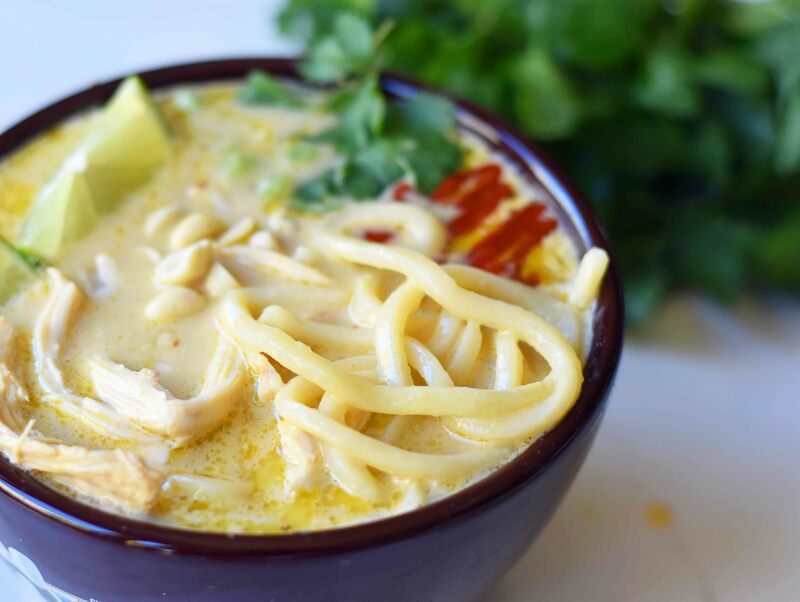 Quick and easy 30-minute Thai curry coconut noodle bowls. Heat large pot over medium-high heat. Add oil. Stir in onion and cook for 5 minutes. Stir in garlic and ginger and cook for 2 minutes longer. Stir in green curry paste, brown sugar, chicken broth, soy sauce, turmeric, and coconut milk. Simmer for 10 minutes. Meanwhile, cook udon or rice noodles according to package instructions. Stir in chicken. Cook for 2-3 minutes. 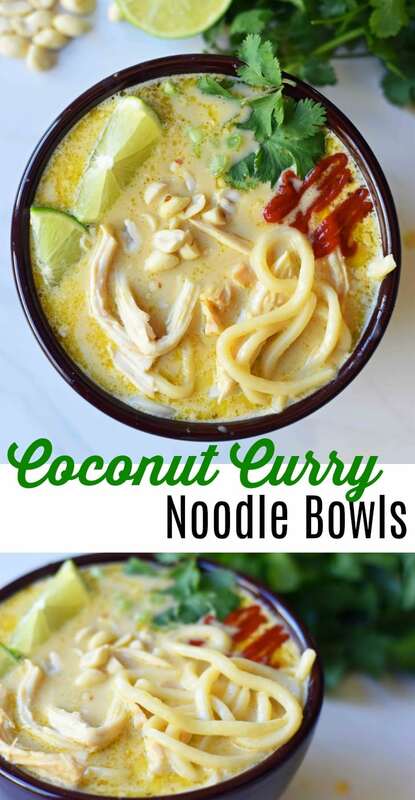 Ladle coconut curry sauce with noodles in bowls. Garnish with cilantro, sriracha sauce, and peanuts. I hope your family loves these Chicken Curry Bowls! Let me know what you think. Happy Cooking, my friends! I made this recipe today. It was excellent! Thank you for sharing. Can’t wait to try more of your recipes. Thank you, Judith! I am so happy to hear that you loved it. I appreciate it! This is my family’s favorite meal I make. My husband actually requested it for his birthday dinner! Sometimes I sub in zoodles to make it healthier, but it’s definitely tastier with real noodles. Thank you so much! !